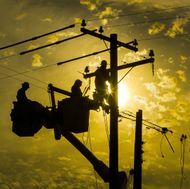 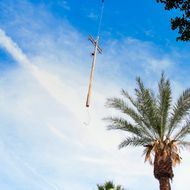 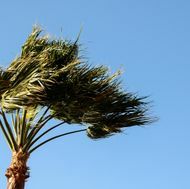 An SCE crane crew helps replace a power pole in Palm Desert, California. 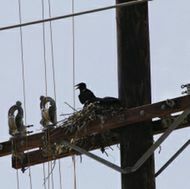 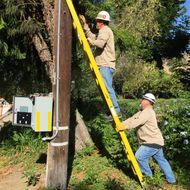 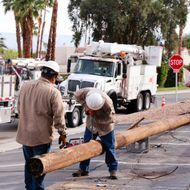 SCE Transmission & Distribution field crews prepare a new pole to replace a deteriorated pole in Palm Desert, California. 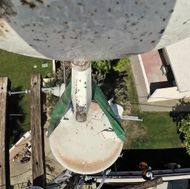 The new pole is lifted over an apartment complex to the backyard. 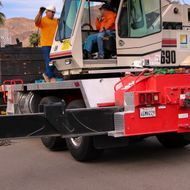 Crane operator Gilbert Everhart (left) and John Potter prepare counterweights on the crane before starting the work. 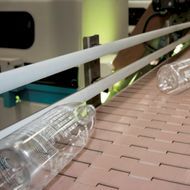 Huy Fong Foods Sriracha Hot Chili Sauce bottles in motion. 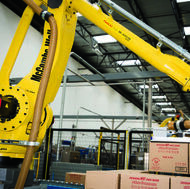 A robotic arm moves boxes of sriracha sauce. 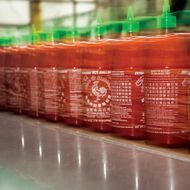 Empty sriracha bottles are ready to be filled.